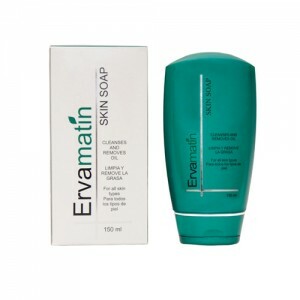 Ervamatin Skin Soap is a liquid soap that cleans and purifies the face, providing a healthier look for all skin types. It acts deeply on the pores helping to prevent acne and blackheads. Ervamatin Skin Soap removes excess oil and hydrates deeply, giving a softer appearance to the skin. The continuous use of this product prevents the appearance of pimples and blackheads as its pH levels are similar to the natural levels of the skin, offering a biological protection against bacteria. The active ingredient of hamamelis has astringent properties and relieves inflammation. It can be used daily on the face and neck and has no side effects.